Even casual visitors to Jesuit often comment on the strong religious identity of the school. They notice not just the external markers of identity – the new Chapel of the Holy Cross, the Bell Tower, and the statues – but the inner disposition of our students and faculty. More frequent visitors also observe the programs that foster religious growth and deepen the Ignatian identity of our school community. The first of Jesuit’s four strategic priorities is to be a national model in how a Jesuit school thrives in its Catholic identity. This is a great challenge for Jesuit schools around the country. Community Service – Tens of thousands of hours contributed by our students, faculty, and staff serving others in need, not only here in Tampa, but through immersion experiences across North America. Led by director of community service Andy Wood '92, we are renewing our effort to anchor Jesuit’s community service in the Gospel imperative to serve “the least” of the brethren of Jesus. Retreat Program – The commitment to a strong, annual retreat program, whose centerpiece is the Junior Kairos retreat. The retreats have increasingly become moments of conversion and renewal of faith for many of our students. The Peer Ministry program, under assistant principal Fr. Patrick Hough, S.J., has engaged students as witnesses and examples for their own classmates. Sacramental Life/Worship – Two daily Masses offered on campus, Masses and confessions celebrated on all retreats, adoration of the Blessed Sacrament once a month, an altar server program that includes nearly 10% of the student body, a liturgical choir of rare quality that draws from the rich patrimony of Western liturgical music. Daily Instruction – An outstanding theology department with an integrated curriculum that seeks to reach the heart and mind of our students, and that exposes them to Catholic belief, practice, and tradition. Special talks and religious presentations at Convocation by nationally-known figures of faith as well as by members of our own school community augment what the students receive in class. Faculty/Staff Formation – An annual two-day faculty/staff retreat led by Jesuit retreat masters from around the country; a three-year Ignatian identity program for new faculty and staff; faculty/staff participation in student retreats, mission trips, and pilgrimages; the presence on campus of the Jesuit residence and the contribution and leadership offered by Jesuit priests and scholastics. 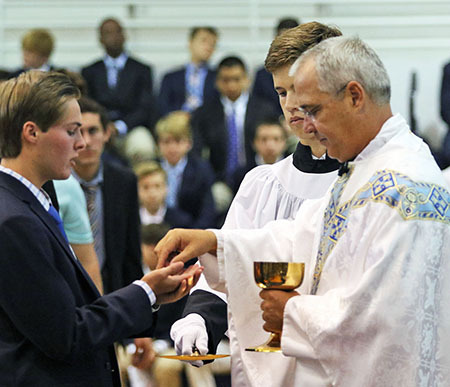 The identity of Jesuit High School is anchored and given direction by our mission to form “Men for Others,” engaged in the world and dedicated to serving God by being open to growth, intellectually competent, religious, loving, and just. At Jesuit, these ideals are being lived out each day, better than ever, by the current generation of Tiger students. Rev. Richard C. Hermes, S.J.